In his essay ‘On the Love of the Lotus’ (Ai lian shuo), Chinese neo-Confucian philosopher Chou Tun-I (Zhou Dunyi), of the Song Dynasty, referred to the lotus blossom as a ‘noble soul.’ During the peak of the summer heat, you are bound to encounter lotus blossoms adorning the area around Anapji Pond, poised resplendently like noble souls. I visited Hayeonji and saw the lotuses while they were still in season. 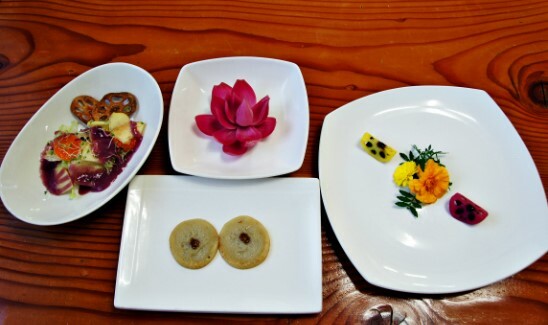 At Hayeonji, a restaurant specializing in lotus-based cuisine, every menu item entails lotuses. Starting and ending with the lotus, from appetizer to dessert, it was a pure and exquisite meal. I would like to tell you about Hayeonji. And all the while it quietly holds its upright stance in peace. It can only be admired from afar, not to be sullied nor debased. 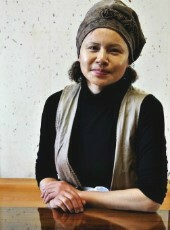 Kyung-hwa Kim, the proprieter of Hayeonji, started this business because she likes lotuses. She is at least as much a lotus lover as the Song Dynasty’s Chou Tun-I, possibly more. Her motive may sound simple enough, but the execution has not been an easy road. 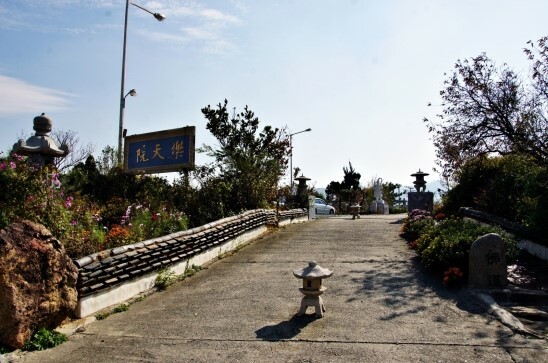 In her search for a location to open a lotus restaurant in Korea, she left no stone unturned, she says, contemplating places from Muan-gun in South Jeolla Province, well-known for producing high-quality lotuses, to Siheung’s Gwangbokji pond, where a large lotus complex is situated. Ms. Kim feels that lotuses are a natural match for Gyeongju, the former capital of Silla, where the people dreamt of the pure land of Buddhism. The dining table she serves is permeated with the powerful scent of lotus blossoms. 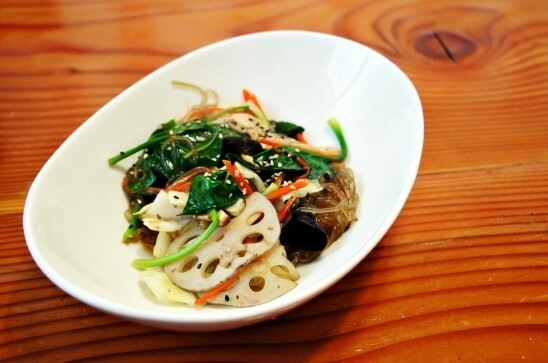 We ordered yeon-yori jeongsik, the full-course meal of lotus cuisine. 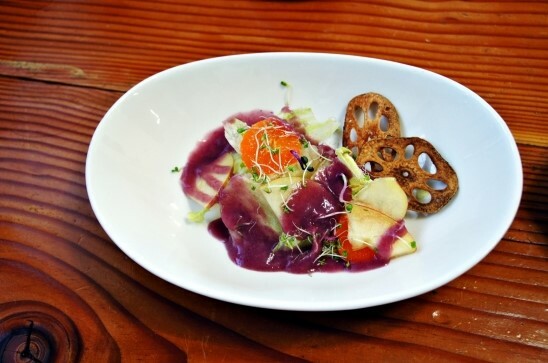 The appetizer shown above is a marinated onion arranged in the form of a lotus blossom, which pleased our eyes with its brilliant hue and beautiful shape. I had the odd sensation that one of the scarlet lotus blossoms I’d seen at Anapji Pond last summer had appeared on our table. I was reluctant to eat it. 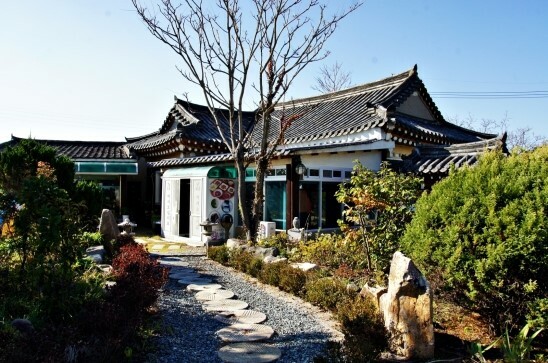 Hayeonji is one of the restaurants designated by the city of Gyeongju and North Gyeongsang Provinceas a culinary establishment that highlights Korean history and culture. 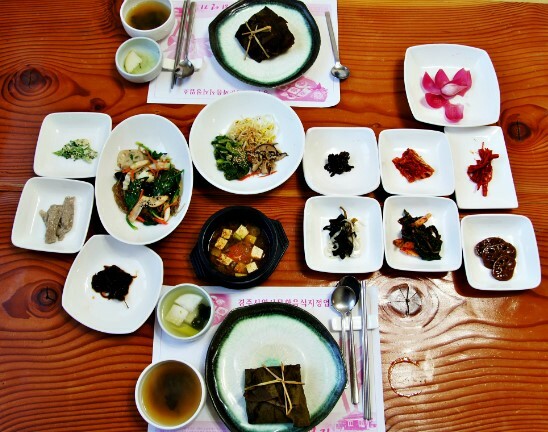 As something that embodies a thousand years of history, food is another important cultural artifact you can encounter in Gyeongju. That is the vision and motto of Hayeonji, says Ms. Kim. Keeping that in mind, I sampled and savored the succession of appetizers one small bite at a time. So far, this has been a relaxing and unhurried meal. Although my hands and mouth were working busily trying this and that, the time spent at Hayeonji felt long and leisurely, as I was taking more care than usual in chewing the exquisite healthful food. Doesn’t that also enhance the pleasure of the meal? 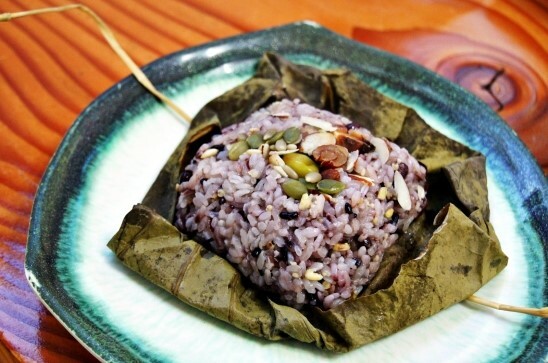 After the appetizers, the main entrée that appears on the table is yeon-ip-bap, rice steamed inside a lotus leaf. Ms. Kim says she grows the lotuses herself on the slopes of Bakdal-san (Bakdal Mountain) in the village of Naenam in Gyeongju. She says she’s been doing research for several years to produce lotus leaves with the proper fragrance and softness. 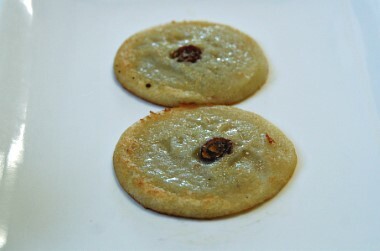 The steamed glutinous rice, topped with tasty treats like ginkgo nuts, acorns, and jujubes, holds a beautiful fragrance within the steamed lotus leaf. 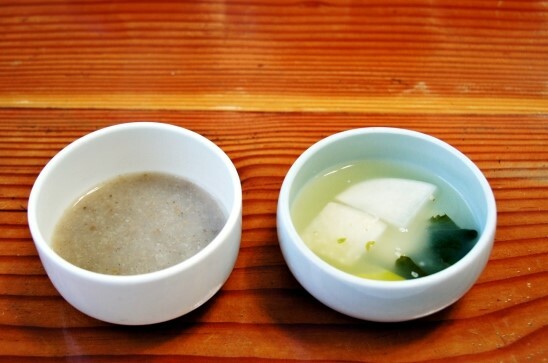 The rice is served with wholesomely plain side dishes. The food is so good, I can’t help but gorge myself. The lotus adorning the finale. Lotus leaf tea is served before the meal, instead of plain water. This is the lotus blossom tea served for dessert. 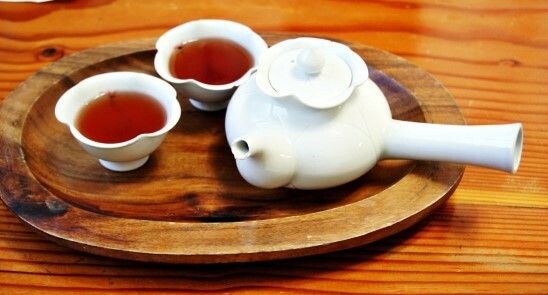 Although both teas have the same reddish hue, the lotus leaf tea has the distinctive and slightly bitter taste of the leaf, while the lotus blossom tea was mild with a sweet aftertaste. That was the conclusion my friends and I reached as we sipped our glasses of lotus leaf tea and cups of lotus blossom tea. Personally, lotus leaf tea suits me better. Promise yourself right now to make a trip at the end of next summer to see the lotuses at the lotus pond. 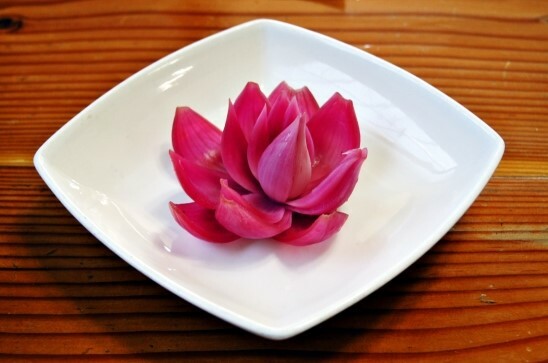 But you can enjoy the lotus as part of a memorable meal all year long. 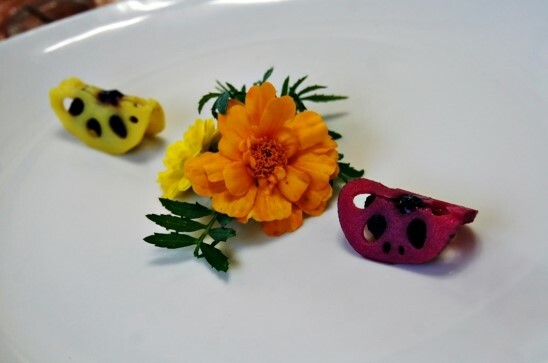 Stop by at Hayeonji in Gyeongju for a meal that is quite special and exquisite. The more time passes since that lovely meal, the more I crave another feast of fragrant lotus blossoms. Hayeonji is located on the road between Gyeongju Hyanggyo (Confucian school) and Oreung (Silla five tombs complex). The road to Hayeonji from the Hyanggyo, passing along Namcheon stream, is really pretty. Since the restaurant is no more than one kilometer away from Cheomseongdae Astronomical Observatory, Gyerim Fortress, and Gyeongju Hyanggyo, it is even possible to walk there. If you’d like to go by bus, take one of the outbound buses numbered in the 500s in the direction of Naenam. Get off at a stop either in the village of Gukdang or in Tapri. From there, it is less than ten minutes on foot.